In 2012 she entered the bachelor’s day department of the Faculty of Law of Karaganda State University named after academician E. A. Buketov with a degree in jurisprudence, which she graduated in 2016. Theme of the thesis — «Қылмыс Nikolaystіnіs» (the subject of the crime). In the period from 04/04/2014 to 05/05/2014, she underwent training under the program “Practical aspects of the work of a novice lawyer” at Law Firm MOVING, Karaganda. - the basics of appealing against inspections of state bodies. 2016 — 2018 She studied at the master’s degree of the scientific and pedagogical direction of Karaganda State University named after academician E. A. Buketov, with a degree in jurisprudence. 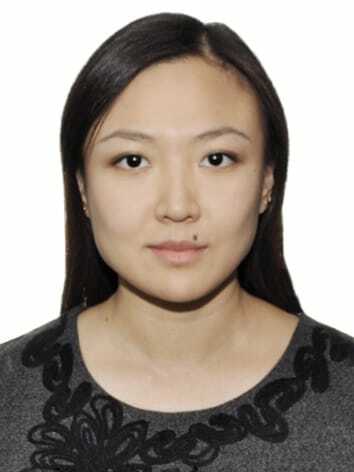 The topic of the master’s thesis is “Kazakh stan құқ kyқty қ zhayyesіndegі zaңdyқ zhauapkershіlіk institutes” (Institute of Legal Responsibility in the System of Law of Kazakhstan). From December 15 to December 29, 2016 she completed a scientific internship on advanced training on the topic: “Constitutional and legal mechanisms for the protection of children in Kazakhstan and in Poland” at the University of Wroclaw, Wroclaw, Republic of Poland. From April 18 to April 28, 2017 she completed a scientific internship on the topic: «International Economics» at the University of Jan Amos Kamensky, Prague, Czech Republic.